Mining machinery industry has experienced a long term of development and mining hammer crusher has an even longer history. From the earliest foreign technology to the latest technological level of domestic hammer crusher, all illustrate the importance of mining hammer crusher among mining machinery. In recent years, many people have set about striving for improving the steel structure and wear resistance on the base of ordinary high manganese steel, and have achieved a series of positive results in enhancing hammer's wear-resisting ability and comprehensive strength. Mining hammer crusher is a type of high performance crushing machine, which has an extensive application in mining, metallurgy, construction, coal, chemical industry and many other departments. 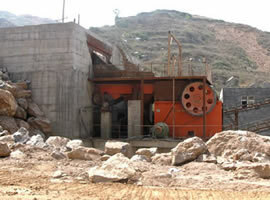 Antifriction bearing is one of the most important spare parts for mineral hammer crusher. 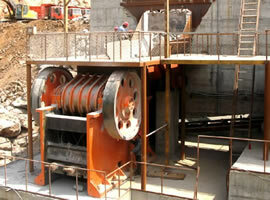 In the design of mining hammer crusher, the antifriction bearing must be designed reasonably. In general, the antifriction bearing is composed by inner ring, outer ring, rolling element and retainer. The inner ring is fixed in the bearing shaft seat or in the bearing hole on the spare parts. On the outer ring, there is a raceway. When the inner ring and outer ring are rotating oppositely, the rolling element will roll along the raceway. Our mining hammer crusher machine has presented strong toughness and excellent wear resistance through the abundant experiments, quantity production and actual use. Its hammer's hardness, strength and toughness all have been improved greatly and its mechanical property has been further enhanced also, significantly prolonging the whole machine's service life. Except for hammer crusher, our company also supplies other mining equipment, such as jaw crusher, impact crusher, cone crusher, roll crusher, magnetic separator, flotation machine, dryer, mobile crusher station, grinding machine and so on. Welcome your consultation!